In clinical research; results are dependent on data. Data is only as good as the data collection tools used to gather it. Furthermore, the best and most accurate data comes from the surgeon or the surgical team themselves at the time of care (versus third-party lay person data collection via chart review). However, there are some limitations that are imposed when following these guidelines; such as the collection of 30-day follow-up information. Data collection needs to be simple and relatively speedy. The ideal tools allow surgeons to collect the essential data at the time of discharge (when information is fresh), limit additional paper accumulation and are submitted at the time of completion. This necessitates the development of electronic applications. At the time of this writing, I am currently working on the development of both smart phone and web-based applications for data collection for the altitude project. These electronic forms will allow data to be entered and submitted at the time of collection. A secondary application is being developed to address the patient re-admission or development of complications post-discharge in the first thirty days after discharge. 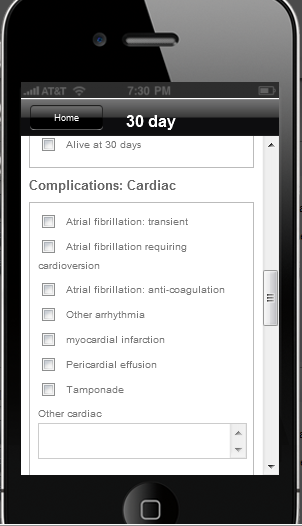 Downloadable pdfs and/or spreadsheets will also be available for surgeons who elect to use the ‘paper’ option. Since the data has only limited patient identifiers, and all data is being submitted to a clinical investigator, (versus outside companies) patient privacy is protected. When completed, further information will be posted here at Cirugia de Torax.